And so it is that I sit here tonight with my thoughts swirling around the reason I became a wildlife rehabilitator. A fox squirrel named Sunny. Our first meeting on Labor Day in 1999 was, as I’ve often said, my introduction to what was then and continues to be now a true labor of love. 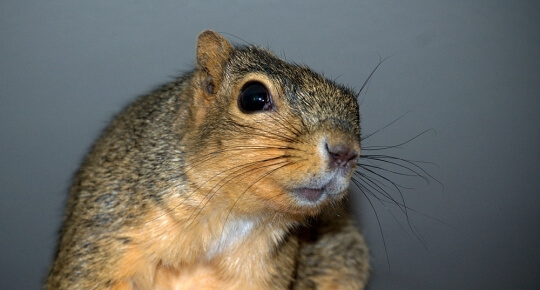 This one small fox squirrel, the first baby I ever raised, turned out to be non-releaseable and so became the primary ambassador for my work with these beloved furballs. The reasons for Sunny’s life in captivity are varied, however, the one thing that sticks out above the rest is that she knew it long before I conceded the point. And ever since, for almost 9 years now, she has continued to share her uncanny wisdom. A wisdom born of her wild birth and heritage and of her own, singular knowing. The lessons have come with so much love there has never been a day I’ve not been grateful for her furry presence in my life. Now we face one of the hardest lessons those who love truly must learn. Sunny has developed cancer and there are really no viable options available to help her. It is not for a lack of trying; my vet performed the initial removal of the tumor and we met with a most experienced veterinary oncologist this morning. But the extent of the cancer is so deep-seated there is no guarantee she can be put back together enough to properly function after any further surgery, leaving no choice but euthanasia while she is under surgical anesthesia. The other option is to simply let this run its inevitable course, which will likely interfere with her functioning to the point euthanasia will be the only kindness left. As the oncologist noted, however, there is still an awful lot of life left in her. Sunny is certainly what can be termed an older squirrel but her name remains the essence of her being. She carries on with our daily routines as we have always done and though her appetite has flagged and she has lost weight through the stress of the last month, she’s certainly not given up and so is more spoiled than ever in terms of tempting tidbits of foodstuffs. As I pore through the literature for specific alternative health treatments, I again find reflections of her innate wisdom in, of all things, her food choices. It is said that cancer cannot survive in an alkaline environment; Sunny invariably chooses mostly those things that support an alkaline condition. We are left with so few options. So with both barrels blazing, those things that will keep Sunny comfortable are now sought, bought, and administered. Those things that have been proven to help the body’s immune system are provided as well; what are now considered “old school” remedies such as herbs and homeopathy are again researched and applied with all due diligence. And again interestingly, certain condition-targeted homeopathic remedies arrived in today’s mail and, unlike those being given until now, Sunny willing laps them from the syringe. Many wildlife rehabilitators use homeopathy with great success but the key is finding the right remedy so Sunny’s acceptance of these speaks volumes. The best thing would be for all of this to turn Sunny’s physical functioning around and banish the cancer in its entirety. Certainly, we all face the very real possibility of developing rogue cells and skewed cell replication on a daily basis, unthinkingly relying on the rather heroic immune system to keep such negative occurrences in check. But once any “bad” cells manage to reach critical mass, the job of getting rid of them becomes that much harder. Yet the annals of medicine are full of stories of “spontaneous remissions” and they are not so much a miracle as an individual’s response to a root-cause appropriate and applicable assist. Even if today’s science is still at a loss to explain it. But when all is said and done, it’s really all and only about the question of quality of life. It’s easy to watch for simple things; such as, is she doing what she always does? Is the look in her eye one of eagerness with energy behind it? Is there a freedom in movement, even if handicapped? These are surely some of the more obvious and valid observations and a prerequisite in providing the best of care to any of our charges, but in all fairness to those we love we must look deeper than that. Experience has shown that sometimes there is a sense of foreboding on an intake that precludes immediate appearance or behaviors and, sure enough, that one doesn’t make it no matter how hard we hope for them. When another resident furball here, old Miss Reggie Love, had come to the end of her journey, despite a short rally I now call the period of indecision on their part, or the period of preparation, her deepest intention was to go, and so go she did. And I knew what was happening the day she made her decision. A full month before her quiet and peaceful passing. This is that “deeper” look that, at least in my not-so-humble opinion, must – absolutely MUST – accompany the external observations. It’s nothing magic, it’s just our instincts; we’re so ingrained to fear dying and death that most people blindly and adamantly deny it. But if we are to do any true justice to those for whom we care, those we love, then we must go beyond our own “stuff” and really hear what they tell us. And both respect and support their decisions. Even to the extent of taking physical action to help ease the crossing over. For we must all one day take our leave of this mortal plane. To watch those we love so dearly go before us is, however, indeed the most bitterest means of gaining wisdom.